The so called "browsing a windows network" made use of an SMB1 protocol version feature. Recent versions of samba, including the one released with bionic, default to a higher versions of the protocol which lacks this feature. 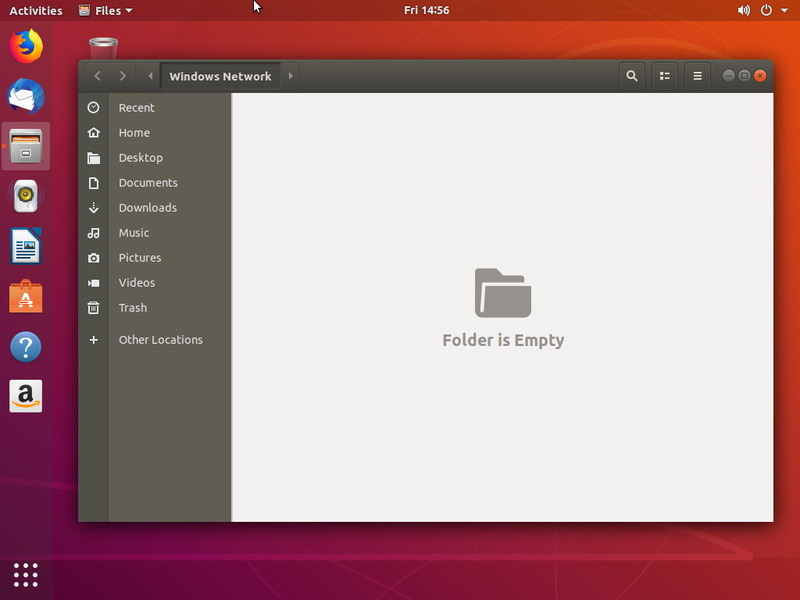 As a result, the "other locations -> windows network" tab in Nautilus is empty even when there are windows or samba machines in the network. Accessing such machines directly, via smb://<name-or-ip>/ type urls, continues to work. gvfs was updated to make use of this api call, if detected at build time. To complete this SRU, gvfs needs a no-change rebuild *after* samba was accepted into proposed. 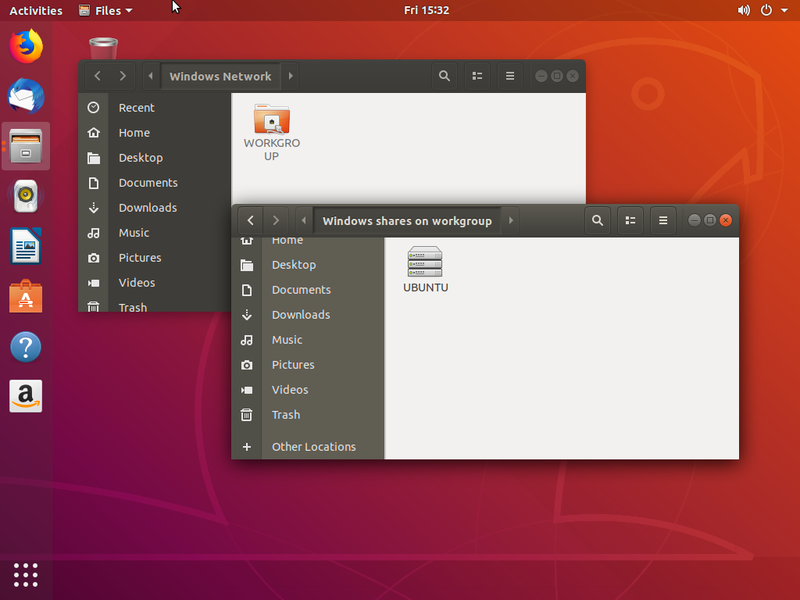 * login at the graphical console as the ubuntu user. Go through the first-user-setup motions as you want. * try to browse the windows network via "other locations -> windows network". 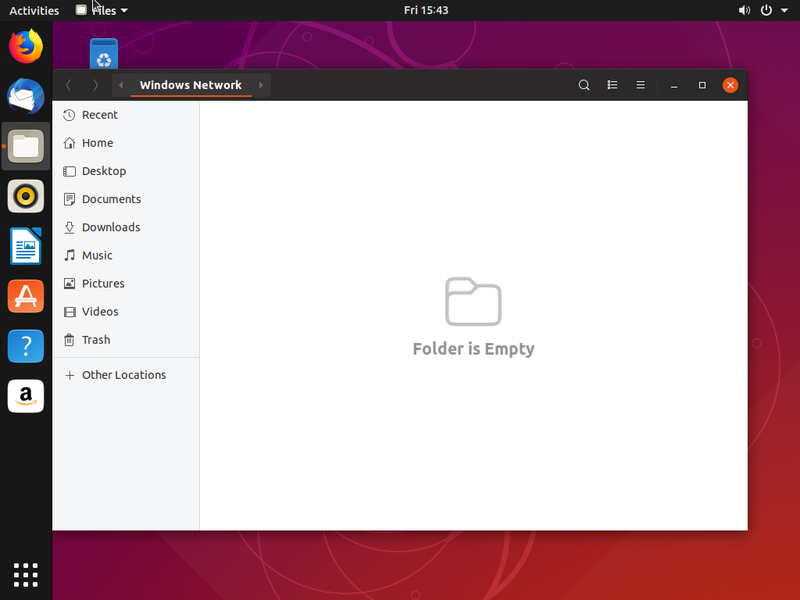 You will get an empty folder. * logout and login again on the gui, browse the windows network again. This time it will show the "WORKGROUP" folder, and if you click through, you will see yourself (your VM) and the [pub] share, among others. * click on the "pub" share, select registered user and login with the ubuntu credentials you created earlier with smbpasswd. The samba update itself just introduces and exposes a new API call. It's up to other applications to make use of that. gvfs was patched to detect this call at build time and use it if it's detected. Packages that are not rebuilt will not see the change, and packages that *are* rebuilt will only see the change if they make use of it. This update introduces a specific runtime dependency between gvfs and libsmbclient due to the new API call added to the latter. Any package that is rebuilt with libsmbclient and makes use of that API call will get this specific dependency. This is handled automatically by dh_mkshlibs. To complete this SRU, gvfs will need a no-change rebuild after samba was accepted into proposed. The smbc_setOptionProtocols() call is only used when the url is like "smb:///", or the server cannot be resolved. The downgrade overrides the setting in smb.conf, and is used just for this case: browsing the network. When connecting to a machine, the url is like "smb://<name>/", and then this function we are adding is not called. I updated the test to actually click on the machine that shows up in the network browsing, and then check with "smbstatus" which version of the protocol was used when connecting to an actual share. Nautilus should show smbtree and host on the smb network. which implements "change to NT1" in gvfs-smb-browse to browse smbtree to aviod adding "max client protocol" = NT1" to smb.conf to switch all samba to unsafe NT1 which most users are doing to correct this bug. The attachment "gvfs-smb-browse change to NT1 from RedHat Bugzilla" seems to be a patch. If it isn't, please remove the "patch" flag from the attachment, remove the "patch" tag, and if you are a member of the ~ubuntu-reviewers, unsubscribe the team. Accepted gvfs into cosmic-proposed. The package will build now and be available at https://launchpad.net/ubuntu/+source/gvfs/1.38.1-0ubuntu1 in a few hours, and then in the -proposed repository. Accepted gvfs into bionic-proposed. The package will build now and be available at https://launchpad.net/ubuntu/+source/gvfs/1.36.1-0ubuntu1.2 in a few hours, and then in the -proposed repository. Accepted gvfs into cosmic-proposed. The package will build now and be available at https://launchpad.net/ubuntu/+source/gvfs/1.38.1-0ubuntu1.1 in a few hours, and then in the -proposed repository. Nautilus still shows me Empty Dir if I enter Windows Network and gvfs can't browse smbtree still. So I assume the patch does not work as expected. SPNEGO login failed: An invalid parameter was passed to a service or function. Checking for function "smbc_setOptionProtocols" : NO"
The API needed is too new for our current libsmbclient version, we need to backport that one as well. Checking for real with a bionic desktop now. That message, "Forcing NT1 protocol version", comes from the gvfs patch and confirms that it is using the new smbc_setOptionProtocols() call. It worked with the updated patch. Packages rebuilt in the PPA. I'll prepare a merge proposal and SRU this into bionic. We will have to rebuild gvfs there, though, after samba lands in proposed. Does the samba task need fixing in disco at all? Accepted samba into cosmic-proposed. The package will build now and be available at https://launchpad.net/ubuntu/+source/samba/2:4.8.4+dfsg-2ubuntu2.2 in a few hours, and then in the -proposed repository. Accepted samba into bionic-proposed. The package will build now and be available at https://launchpad.net/ubuntu/+source/samba/2:4.7.6+dfsg~ubuntu-0ubuntu2.8 in a few hours, and then in the -proposed repository. For anyone wanting to test this bug, please note you will also have to wait for a gvfs rebuild with this new samba package. Now installing the new samba packages. Since I need a gvfs rebuild with the new samba packages, I'm doing that locally. I then reboot, login, and the windows network is populated with the workgroup and the host. Bug reproduced, see attached screenshot. Windows network browsing is empty. Note: there is an old gvfs in proposed already, but it was NOT rebuilt with this samba version. 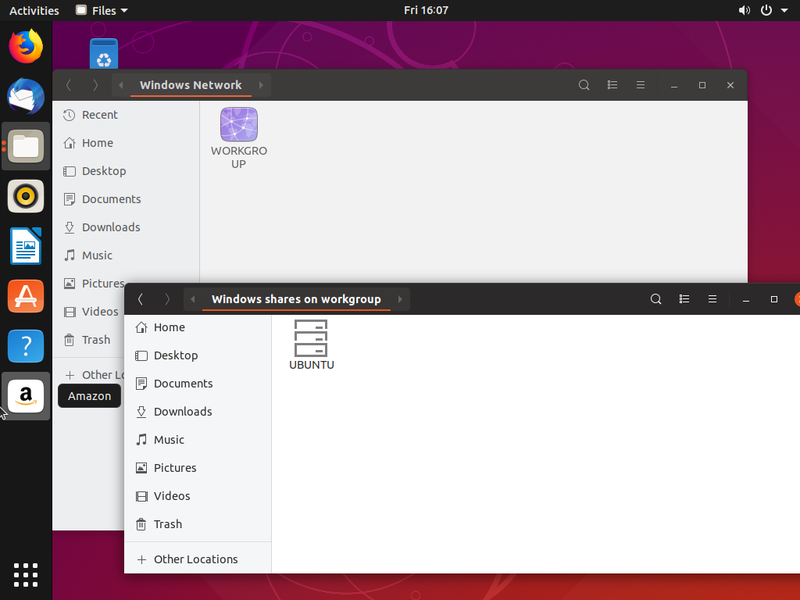 Reboot, login, access windows network, and the workgroup and computer are displayed (see attached screenshot). I think I mixed the verification-done tags, but both are done now. So, looks like was solved in 4.8, but since Disco Dingo 19.04 uses 4.10, looks like it didn't get the fix, not sure. Also, since samba package isn't installed by default (at least in my 18.10 to 19.04 upgrade), how do we fix this without the samba package installed? I checked disco when I prepared these updates for bionic and cosmic, and it was allright. Let me re-check with a default install using the CD this time, now that it is released. It worked just fine on a disco desktop default install. I brought up a bionic vm, which has samba running and set to a workgroup called "workgroup" and has a /pub share. On disco, I click on "other locations", then "windows network", and I see "WORKGROUP". I can click on "WORKGROUP", which then shows me the other server. If I click on that, I see the "pub" share. The only samba packages you need for this network browsing are installed: libsmbclient, libwbclient0, samba-libs. I have these with version 4.10.0 as expected.